If you wear it, eat it, drink from it, sit on it, write on it, watch it, or read it, we’ll put a logo on it. We ask the necessary questions, we listen to your challenges, and then work within your timeframe and budget to deliver a program that motivates, recognizes, encourages, increases awareness, or whatever the behavior you're after. ...OR, we could just put a logo on it. 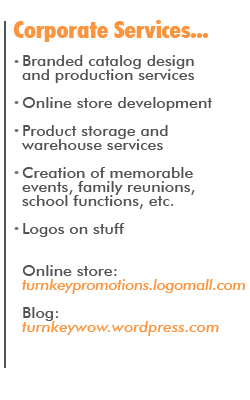 It’s whatever you need, we’re Turnkey. 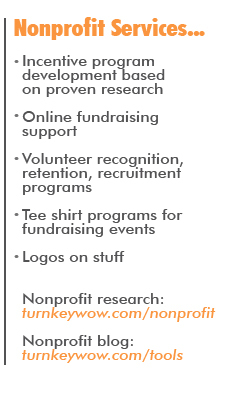 Our nonprofit clients love us because we increase fundraiser income levels and brand awareness, make event participants fundraising machines, free up staff volunteers, and create memorable fundraising events. Our corporate clients love us because we increase sales and brand awareness, make employees happy and productive, make storing products a non-issue, have a sense of humor that is so darn witty! If you're charged with your organization's fundraising event or recognition program, let's talk. Email us or call 800.405.7829 today!